Manager Derek McInnes hopes a further week's preparation can help Aberdeen progress against Siroki Brijeg in next Thursday's Europa League return leg. The Dons were held 1-1 by the team from Bosnia and Herzegovina in their second round tie, as Stipo Markovic cancelled out Ryan Christie's fine opener. "It's difficult to come in at this round against this level of team," McInnes told BBC Scotland at Pittodrie. "I still believe that we can get through the tie." McInnes gave debuts to two of his new signings, Greg Tansey and Gary Mackay-Steven, the latter signing the day before the match. And forwards Greg Stewart and Nicky Maynard, two other new faces at Pittodrie, came on as second-half substitutes. 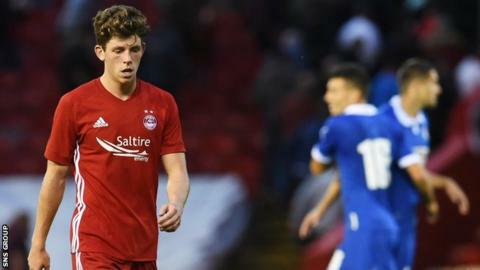 Ryan Christie, back at Aberdeen on a season-long loan from Celtic, curled in an 18th-minute opener for the hosts but they could not convert the further chances that followed and were pegged back by Markovic's strike in 69 minutes. "A lot of the players that we've brought in are at different levels of fitness," said McInnes. "Nicky and Greg (Stewart) are behind, their season finished three weeks before our lads'. Gary is behind in terms of minutes [in pre-season friendlies], although he has been training [with Celtic]. "There's no panic with that. We know it was a bit of a risk. We gave the guys three and a half weeks of a break hoping they would be ready for it. We will be better for having had that game. "We've got minutes in the bag now, we've always got stronger as we have gone through the rounds. There is no doubt that we can score over there. Understandably a lot of the players weren't quite there tonight but we'll get better. "It's only half-time in the tie." The Dons know they will have to score in the heat at the Pecara Stadium to have any chance of reaching the third qualifying round of the competition for a fourth year in a row. While McInnes has faith in his own players to improve and deliver an away win like they did against Groningen in 2014 and Rijeka the year after, he acknowledged that the Bosnia and Herzegovina cup winners were the stronger team in the first leg. "They were better than us tonight. I thought they were well worthy of the draw," said the manager. "But we are comfortable going anywhere. We have beaten better teams on the road before.